‘Heneral Luna,’ the biopic that tells about the life of General Antonio Luna is chosen to be the official entry of the Philippines for the Best Foreign Film category of the Oscars Awards as announced in the movie’s official Facebook page. Lead actor John Arcilla shared in an interview in ANC’s Headstart that being picked as the country’s entry in the Oscars is kind of ironic. 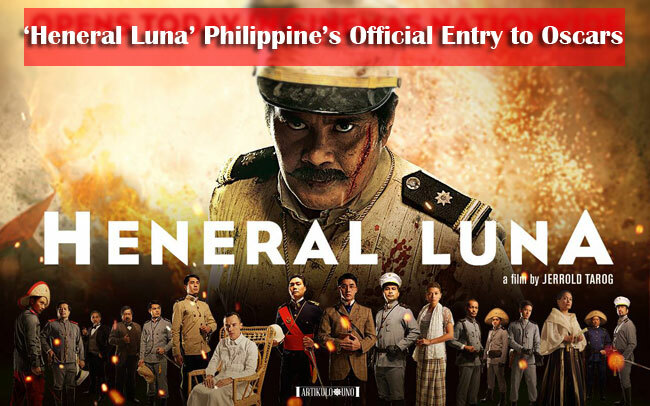 General Luna is known as the greatest general during the country’s war against Americans. He further shared that it is ironic as the general fought the Americans, and now the biopic of the general himself is an entry for America’s prestigious award giving body. He said that despite the war, he thinks that Americans can still appreciate the movie as it goes beyond the Filipino nationalism. He also said that humans can connect with each other through arts such as cinema, dance and music though there may be wars, fights and quarrels. Heneral Luna is not the first biopic of a hero that was done in the Philippine cinematic history, yet it had received a lot of positive attention from the mainstream and critics. Arcilla shared that this may mean that the Filipino audience are ready for such genre. The veteran actor then opined that there are more salient points in the movie other than the patriotism. The movie depicts that Filipinos love their families, but that love itself is also the reason why there is no unity. the country was not loved as a whole because people think more of their role in their family and local regions. The movie is directed by Jerold Tarog. John Arcilla is also joined in the movie by Archie Alemania, Epy Quizon, Mon Confiado, Nonie Buencamino, Ketchup Eusebio, Paolo Avelino, Ronnie Lazaro, Aaron Villaflor, and Mylene Dizon.